Tuxie, also known as the Baby Penguin, is a blue baby penguin that is lost on top of Cool, Cool Mountain in Super Mario 64 and Super Mario 64 DS. She needs to be reunited with her mother. 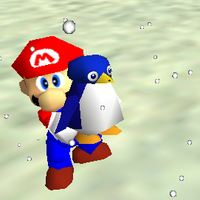 Mario picks Tuxie up and carries her down the mountain to her mother, located at its base. For finding her baby, the mother penguin awards Mario with a Power Star. However, if Tuxie is picked up again after being returned, her mother will follow Mario sternly until he drops her. The name comes from "tux", the shortened form of tuxedo, which is a type of formal suit that bears a resemblance to a penguin's feathers. Tuxie is not actually referred to by name in the game and can easily be confused with another baby penguin who is also located on Cool, Cool Mountain. This latter penguin is located on the roof of the cabin next to Tuxie's mother. If Mario delivers this lookalike to the mother, she tells him that it looks nothing like her child (she says elsewhere that her child has her beak). Tuxie's chirp is quite loud and sounds slightly like a car alarm. However, once Mario picks her up she stops chirping and instead emits a whining cry, which will stop only if Mario lets her go or drops her. The player is able to drop Tuxie off the mountain without angering the mother penguin. But if Tuxie is dropped off the mountain and brought back to the mother, she will be mad, even though Tuxie had been saved from danger twice. If the player falls off while carrying Tuxie, she'll automatically come back up. Mario and Tuxie diving together in Super Mario 64. If Mario performs a dive near both Tuxie and the baby penguin near to Mother Penguin, they will perform a dive as well. In Super Mario 64, they make a different chirp sound. ↑ (June 10, 1998). Course 4 - Star 2: Li'l Penguin Lost. Nintendo: Super Mario 64 Strategy (Internet Archive: Wayback Machine). Retrieved February 23, 2018. This page was last edited on January 28, 2019, at 02:43.